Not just monsters, but ecology notes, lairs, plot hooks... all you need to slot them into your campaign world. Publisher's blurb: "There's no such thing as too many monsters! Here Be Monsters brings new monsters and everything you need in order to use them right now in your campaign. 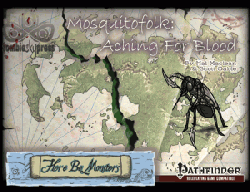 "The mosquitofolk want nothing more than your blood - all of it. And they'll stop at nothing to get it. Some of the creepiest monsters ever imagined, they are fully fleshed out and ready to spring on unsuspecting characters everywhere."